A few years ago the release of any new 1/72 scale plastic figures was a real event. These days you can hardly move for new figures, and more and more manufacturers are getting in on the act. 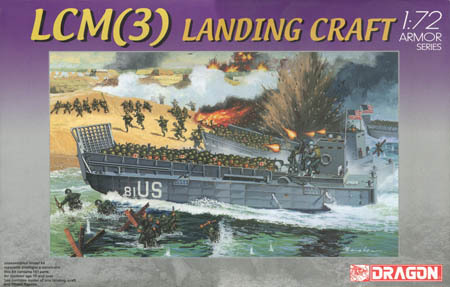 2004 saw the 60th anniversary of D-Day, and among the many special products made to mark the event was Dragon’s model of an LCM(3), a landing craft much used on that momentous day. Dragon seem to have decided their target market for this was the diorama builder and the wargamer, and so included 15 figures and a diorama base to create a whole scene. As usual we will ignore the craft itself and concentrate on the figures that accompany it. 12 of the figures are US infantry, specifically the 29th Infantry Division. There are two identical sprues of 6 figures each, so there are two of each pose. However the figures come in kit form with separate legs, arms, weapons and equipment, so there is scope for changing the poses - those shown on this page follow the manufacturer’s suggestions. If you see the full sprue you can see there is great potential here. 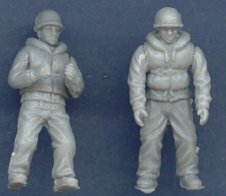 The suggested poses, which are based on an older 1/35 scale Dragon set, are really good in our opinion, recalling something of the Revell US Marines but with more realistic poses due to the freedom that comes from being a kit. Completing the line-up of figures are three sailors. One, with lowered hands, is steering the craft while the other two are manning the two .50 caliber machine guns it mounted. In a market which is still very short of naval figures these three are likely to see service in many World War II models. One of the first things that strikes you about these figures is the incredibly soft material they are made from. It feels like some sort of rubber, and the heart sinks at the likely inability to glue and paint them. In fact they are made of a new cementable vinyl, and we are happy to report that we found they glued very well using ordinary polystyrene cement. Although we have not tested them, we would still imaging their flexibility would make them very difficult to paint, or at least for the paint to stay on. Most parts have square pegs and holes to help guide the pieces together properly, which is good but could be trimmed if different poses are required. For accuracy we really can’t fault these figures. The infantry wear standard uniform and equipment for June 1944, and three of the poses also have their gasmask in a waterproof bag on their chest - a device specifically designed for amphibious landings. Dragon have included a very generous range of hard plastic weapons - more than twice the number of infantry in the set. A good number of rifles are joined by BARs, carbines and Thompson machine guns. One of the carbines has a folding stock - an unlikely weapon for the infantry but with so many spare weapons this just means more great parts for the spares box. The sculpting is excellent with all the clear detail you could want. The figures are well proportioned, and there is no hint of flash, although the soft material makes trimming off the sprue a little tricky as the parts could be torn with rough handling. As can be seen, none come with bases, and some of the standing figures do not stand by themselves, but all the kneeling/crawling poses are fine as they are, and even the sailors will stand unaided. The LCM(3) carried far more than 12 men, but it is a most welcome development for companies like Dragon to make the effort to produce reasonable numbers of figures to bring their vehicles to life. Building sizable units with this product will be very expensive and leave large numbers of unwanted landing craft models, but in our view these figures have much to offer, if only mainly for amphibious landing scenes. We can only hope that Dragon and others make this sort of added value a habit in the future.